The T-Fal Initiatives 10-Piece Nonstick Inside and Out makes cleanup easy. Because there are nonstick coatings inside and out, anything that gets on these pots and pans will slide right off. The nonstick coating also allows you to cook without adding extra oil or butter for healthier, lower calorie meals. The pots and pans in this set feature ergonomically designed handles that are made from a tough plastic material that will stay cool while they’re on the stovetop and are even safe to put in the oven up to 350°F. The lids are made of tempered glass so you can keep an eye on your food without taking the lid off. The lids are also vented so you can choose to either trap or release steam. The T-Fal Initiatives Cookware set includes a 1-quart saucepan with lid, 2-quart saucepan with lid, 5 quart Dutch oven with lid, 8-inch sauté pan, 9.5-inch sauté pan, 11-inch sauté pan, and a vegetable steamer. When researching this product we searched high and low for reviews on dozens of shopping websites but the only site that had any customer reviews was Amazon.com. At the time of this writing there were 143 reviews online and an average user rating of 4.3 stars. The reviews are pretty good overall but there are some concerns as well. Some of the people that left positive reviews said that they were pleasantly surprised with the quality of this set. It can be purchased for under $60 so no one was expecting professional grade cookware. A lot of people are commenting on the quality of the nonstick coating. One person said that their old set of pots and pans were hand-me-downs and the difference between their old set and this one was like night and day. They had macaroni and cheese that was sitting in a pan for five hours and when they finally got around to cleaning the pan it rinsed right out. Since then this person has cooked pancakes, chicken parmesan, fettuccine Alfredo and they say that everything cooks perfectly with even heat and everything they cook, including sauces, slide right off of the nonstick coating. Some customers did complain that the T-Fal Initiatives Cookware set won’t last very long. Some of the people are saying that the nonstick surface will wear away with regular use. One customer said that the nonstick coating began to crack in about six months. They also said that the handle on the lid broke after about a year. A handle on one of the pans broke twice. 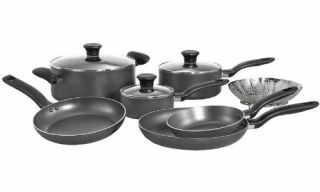 After researching all of the reviews online it seems like the T-Fal Initiatives 10-Piece Nonstick Inside and Out set would be a good set for anyone that is on a very tight budget or someone that is moving out on their own for the first time and needs a good, inexpensive cookware set. It’s probably cheaper in the long run to invest in a high quality set of cookware that will last a lifetime rather than replacing a set every couple of years but if you don’t have the money to invest in a lifelong set of cookware or if you’re not ready to make that kind of commitment yet, this particular set will work for you for a year or two.